﻿The Green-Roofed Barn draws upon Scottish fiddle music. However, it has a quirky spirit in how there are measures with missing beats. Note: the demo recording is a Sibelius midi of only the melody. This tune came about when I was hiking in the hills of York County, PA near the Susquehanna River. I saw a barn with a green roof in the valley below. The barn had a sense of joyful grace about it and I began to hear this Strathspey in my mind. The tune was originally written in a traditional style. However, as the music evolved I decided to remove several notes as being too repetitive (notated as measures of 3/4). This gave the tune a quirkiness that appealed to me. As I figured, many hundreds of traditional Strathspeys have already been written. This tune is meant to be something different. 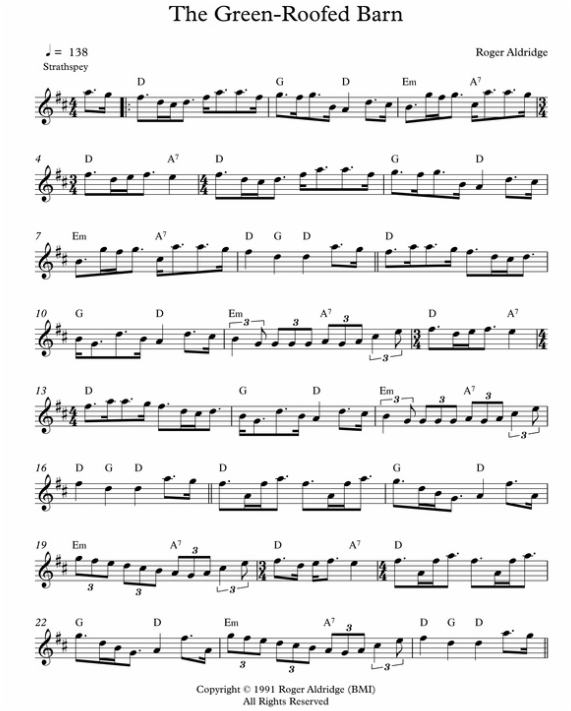 Here is the tune played much faster by Amy Leonard, violin; E. Shawn Qaissaunee, guitar; and Peter McCarthy, bass.